The term chronic inflammatory demyelinating polyradiculoneuropathy (CIDP) has been used to identify patients with a chronically progressive or relapsing symmetric sensorimotor disorder with cytoalbuminologic dissociation and interstitial and perivascular endoneurial infiltration by lymphocytes and macrophages. It can be considered the chronic equivalent of acute inflammatory demyelinating polyradiculoneuropathy, the most common form of Guillain-Barré syndrome. Pertinent physical findings are limited to the nervous system, except when the condition is associated with other diseases. Such findings may include the following. Electron micrograph of the peripheral nerve of a patient with chronic inflammatory demyelinating polyradiculoneuropathy. 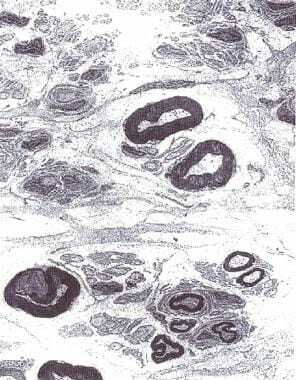 Note "onion bulb" formation in the myelin sheath of the nerve fibers due to continuous demyelination and remyelination. Courtesy of A. Sima, MD, Department of Pathology, Wayne State University. Chronic inflammatory demyelinating polyradiculoneuropathy is presumed to occur because of immunologic antibody-mediated reaction along with interstitial and perivascular infiltration of the endoneurium with inflammatory T cells and macrophages. The consequence is a segmental demyelination of peripheral nerves. Human leukocyte antigens Dw3, DRw3, A1, and B8 occur more frequently in patients with CIDP than in the healthy population. Cytoalbuminologic dissociation is a characteristic finding in cerebrospinal fluid (CSF) pointing to nerve root involvement. Occasionally, CSF studies reveal mild lymphocytic pleocytosis and elevation of gamma globulin level, but this is observed most frequently in HIV-positive patients. The term chronic inflammatory demyelinating polyradiculoneuropathy (CIDP) has been used to identify patients with a chronically progressive or relapsing symmetric sensorimotor disorder with cytoalbuminologic dissociation and interstitial and perivascular endoneurial infiltration by lymphocytes and macrophages. In many ways, CIDP can be considered the chronic equivalent of acute inflammatory demyelinating polyradiculoneuropathy (AIDP), the most common form of Guillain-Barré syndrome (GBS). A number of variants of CIDP have been described that have immune or inflammatory aspects and electrophysiologic and/or pathologic evidence of demyelination in common. No consensus exists on the best approach to the nomenclature of these disorders. CIDP is a major subset of chronic acquired demyelinating polyneuropathies (CADP). In this context, CIDP is considered when patients have a symmetric proximal and distal motor predominant disorder. CIDP variants include patients with predominantly sensory symptoms, those with a distal symmetric disorder (DADS), those with multifocal sensorimotor neuropathy or sensorimotor mononeuropathy multiplex with prominent conduction block (also known as Lewis-Sumner neuropathy), and those with CIDP with associated CNS demyelination or with other systemic disorders. The following disorders are considered distinct from CIDP because they have specific pathophysiologic features and respond to treatments differently than do patients with CIDP: Demyelinating neuropathies associated with immunoglobulin M (IgM) paraproteins, including those with anti–myelin-associated glycoprotein (MAG) antibodies; polyneuropathy, organomegaly, endocrinopathy, monoclonal gammopathy, and skin changes (POEMS) syndrome; and multifocal motor neuropathy. Chronic inflammatory demyelinating polyradiculoneuropathy most commonly has an insidious onset and either chronic progressive or relapsing course. Occasionally, complete remissions occur. Quadriplegia, respiratory failure, and death have been described but are rare. No racial predilection has been identified. Both sexes are affected. Of CADP variants, multifocal motor neuropathy has a male predominance of at least 2:1 based on a survey of the largest case series. Chronic inflammatory demyelinating polyradiculoneuropathy may occur at any age, but it is more common in the fifth and sixth decades. Relapsing course is associated with younger age of patients (third and fourth decades). CIDP has been described in childhood. Rajabally YA, Simpson BS, Beri S, Bankart J, Gosalakkal JA. Epidemiologic variability of chronic inflammatory demyelinating polyneuropathy with different diagnostic criteria: study of a UK population. Muscle Nerve. 2009 Apr. 39(4):432-8. [Medline]. Press R, Hiew FL, Rajabally YA. Steroids for chronic inflammatory demyelinating polyradiculoneuropathy: evidence base and clinical practice. Acta Neurol Scand. 2016 Apr. 133 (4):228-38. [Medline]. Oaklander AL, Lunn MP, Hughes RA, van Schaik IN, Frost C, Chalk CH. Treatments for chronic inflammatory demyelinating polyradiculoneuropathy (CIDP): an overview of systematic reviews. Cochrane Database Syst Rev. 2017 Jan 13. 1:CD010369. [Medline]. Hughes RA, Donofrio P, Bril V, et al. Intravenous immune globulin (10% caprylate-chromatography purified) for the treatment of chronic inflammatory demyelinating polyradiculoneuropathy (ICE study): a randomised placebo-controlled trial. Lancet Neurol. 2008 Feb. 7(2):136-44. [Medline]. Gorson KC, van Schaik IN, Merkies IS, et al. Chronic inflammatory demyelinating polyneuropathy disease activity status: recommendations for clinical research standards and use in clinical practice. J Peripher Nerv Syst. 2010 Dec. 15(4):326-33. [Medline]. Eftimov F, Vermeulen M, van Doorn PA, Brusse E, van Schaik IN. Long-term remission of CIDP after pulsed dexamethasone or short-term prednisolone treatment. Neurology. 2012 Apr 3. 78(14):1079-84. [Medline]. Barnett MH, Pollard JD, Davies L, McLeod JG. Cyclosporin A in resistant chronic inflammatory demyelinating polyradiculoneuropathy. Muscle Nerve. 1998 Apr. 21(4):454-60. [Medline]. Barohn RJ, Kissel JT, Warmolts JR, Mendell JR. Chronic inflammatory demyelinating polyradiculoneuropathy. Clinical characteristics, course, and recommendations for diagnostic criteria. Arch Neurol. 1989 Aug. 46(8):878-84. [Medline]. Barohn RJ, Saperstein DS. Guillain-Barré syndrome and chronic inflammatory demyelinating polyneuropathy. Semin Neurol. 1998. 18(1):49-61. [Medline]. Bouchard C, Lacroix C, Plante V, et al. Clinicopathologic findings and prognosis of chronic inflammatory demyelinating polyneuropathy. Neurology. 1999 Feb. 52(3):498-503. [Medline]. Bromberg MB. Comparison of electrodiagnostic criteria for primary demyelination in chronic polyneuropathy. Muscle Nerve. 1991 Oct. 14(10):968-76. [Medline]. Chassande B, Leger JM, Younes-Chennoufi AB, et al. Peripheral neuropathy associated with IgM monoclonal gammopathy: correlations between M-protein antibody activity and clinical/electrophysiological features in 40 cases. Muscle Nerve. 1998 Jan. 21(1):55-62. [Medline]. Chaudhry V. Multifocal motor neuropathy. Semin Neurol. 1998. 18(1):73-81. [Medline]. Dalakas MC, Quarles RH, Farrer RG, et al. A controlled study of intravenous immunoglobulin in demyelinating neuropathy with IgM gammopathy. Ann Neurol. 1996 Nov. 40(5):792-5. [Medline]. Donofrio PD. Chronic inflammatory demyelinating polyradiculoneuropathy: new views and guidelines. J Peripher Nerv Syst. 2005 Sep. 10(3):217-9. [Medline]. Dyck PJ, Daube J, O'Brien P, et al. Plasma exchange in chronic inflammatory demyelinating polyradiculoneuropathy. N Engl J Med. 1986 Feb 20. 314(8):461-5. [Medline]. Dyck PJ, Lais AC, Ohta M, Bastron JA, Okazaki H, Groover RV. Chronic inflammatory polyradiculoneuropathy. Mayo Clin Proc. 1975 Nov. 50(11):621-37. [Medline]. Dyck PJ, Litchy WJ, Kratz KM, et al. A plasma exchange versus immune globulin infusion trial in chronic inflammatory demyelinating polyradiculoneuropathy. Ann Neurol. 1994 Dec. 36(6):838-45. [Medline]. Erdmann PG, van Meeteren NL, Kalmijn S, Wokke JH, Helders PJ, van den Berg LH. Functional health status of patients with chronic inflammatory neuropathies. J Peripher Nerv Syst. 2005 Jun. 10(2):181-9. [Medline]. European Federation of Neurological Societies/Peripheral Nerve Society Guideline on management of chronic inflammatory demyelinating polyradiculoneuropathy. Report of a joint task force of the European Federation of Neurological Societies and the Peripheral Nerve Society. J Peripher Nerv Syst. 2005 Sep. 10(3):220-8. [Medline]. Good JL, Chehrenama M, Mayer RF, Koski CL. Pulse cyclophosphamide therapy in chronic inflammatory demyelinating polyneuropathy. Neurology. 1998 Dec. 51(6):1735-8. [Medline]. Gorson KC, Allam G, Ropper AH. Chronic inflammatory demyelinating polyneuropathy: clinical features and response to treatment in 67 consecutive patients with and without a monoclonal gammopathy. Neurology. 1997 Feb. 48(2):321-8. [Medline]. Hadden RD, Hughes RA. Treatment of immune-mediated inflammatory neuropathies. Curr Opin Neurol. 1999 Oct. 12(5):573-9. [Medline]. Hobson-Webb LD, Donofrio PD. Inflammatory neuropathies: an update on evaluation and treatment. Curr Rheumatol Rep. 2005 Oct. 7(5):348-55. [Medline]. Jann S, Beretta S, Bramerio MA. Different types of chronic inflammatory demyelinating polyneuropathy have a different clinical course and response to treatment. Muscle Nerve. 2005 Sep. 32(3):351-6. [Medline]. Korinthenberg R. Chronic inflammatory demyelinating polyradiculoneuropathy in children and their response to treatment. Neuropediatrics. 1999 Aug. 30(4):190-6. [Medline]. Léger JM, Behin A. Multifocal motor neuropathy. Curr Opin Neurol. 2005 Oct. 18(5):567-73. [Medline]. Mahattanakul W, Crawford TO, Griffin JW, Goldstein JM, Cornblath DR. Treatment of chronic inflammatory demyelinating polyneuropathy with cyclosporin-A. J Neurol Neurosurg Psychiatry. 1996 Feb. 60(2):185-7. [Medline]. [Full Text]. Markvardsen LH, Debost JC, Harbo T, Sindrup SH, Andersen H, Christiansen I, et al. Subcutaneous immunoglobulin in responders to intravenous therapy with chronic inflammatory demyelinating polyradiculoneuropathy. Eur J Neurol. 2013 Jan 7. [Medline]. Mendell JR, Barohn RJ, Freimer ML, et al. Randomized controlled trial of IVIg in untreated chronic inflammatory demyelinating polyradiculoneuropathy. Neurology. 2001 Feb 27. 56(4):445-9. [Medline]. Notermans NC, Franssen H, Eurelings M, Van der Graaf Y, Wokke JH. Diagnostic criteria for demyelinating polyneuropathy associated with monoclonal gammopathy. Muscle Nerve. 2000 Jan. 23(1):73-9. [Medline]. Rotta FT, Sussman AT, Bradley WG, Ram Ayyar D, Sharma KR, Shebert RT. The spectrum of chronic inflammatory demyelinating polyneuropathy. J Neurol Sci. 2000 Feb 15. 173(2):129-39. [Medline]. Saperstein DS, Amato AA, Wolfe GI, et al. Multifocal acquired demyelinating sensory and motor neuropathy: the Lewis-Sumner syndrome. Muscle Nerve. 1999 May. 22(5):560-6. [Medline]. Saperstein DS, Katz JS, Amato AA, Barohn RJ. Clinical spectrum of chronic acquired demyelinating polyneuropathies. Muscle Nerve. 2001 Mar. 24(3):311-24. [Medline]. Stamboulis E, Katsaros N, Koutsis G, Iakovidou H, Giannakopoulou A, Simintzi I. Clinical and subclinical autonomic dysfunction in chronic inflammatory demyelinating polyradiculoneuropathy. Muscle Nerve. 2006 Jan. 33(1):78-84. [Medline]. Uncini A, De Angelis MV, Di Muzio A, et al. Chronic inflammatory demyelinating polyneuropathy in diabetics: motor conductions are important in the differential diagnosis with diabetic polyneuropathy. Clin Neurophysiol. 1999 Apr. 110(4):705-11. [Medline]. Visudtibhan A, Chiemchanya S, Visudhiphan P. Cyclosporine in chronic inflammatory demyelinating polyradiculoneuropathy. Pediatr Neurol. 2005 Nov. 33(5):368-72. [Medline]. van Schaik IN, van Geloven N, Bril V, Hartung HP, Lewis RA, Sobue G, et al. Subcutaneous immunoglobulin for maintenance treatment in chronic inflammatory demyelinating polyneuropathy (The PATH Study): study protocol for a randomized controlled trial. Trials. 2016 Jul 25. 17 (1):345. [Medline]. [Full Text]. Léger JM, De Bleecker JL, Sommer C, Robberecht W, Saarela M, Kamienowski J, et al. Efficacy and safety of Privigen(®) in patients with chronic inflammatory demyelinating polyneuropathy: results of a prospective, single-arm, open-label Phase III study (the PRIMA study). J Peripher Nerv Syst. 2013 Jun. 18 (2):130-40. [Medline]. [Full Text]. van Schaik IN, et al. Subcutaneous immunoglobulin for maintenance treatment in chronic inflammatory demyelinating polyneuropathy (PATH): a randomised, double-blind, placebo-controlled, phase 3 trial. The Lancet Neurology. 2018. 17 (1):35-46. [Full Text]. Electromyography of a patient with chronic inflammatory demyelinating polyradiculoneuropathy illustrating conduction block, temporal dispersion of compound muscle action potential, prolonged distal latencies, and slowed conduction. Prolonged F wave latencies (normal is &lt; 31). Disclosure: Received grant/research funds from GBS/CIDP FI for other; Received consulting fee from Baxter for consulting; Received grant/research funds from Baxter for none; Received consulting fee from CSL Behring for consulting. The authors and editors of Medscape Reference gratefully acknowledge the contributions of previous author Marina Zvartau-Hind, MD, PhD, to the development and writing of this article. Fast Five Quiz: How Much Do You Know About Chronic Inflammatory Demyelinating Polyradiculoneuropathy? How Common Is CIDP Misdiagnosis?